This returns a list of note names for the current selection. This is primarily intended as a demonstration of the Lua scripting engine. Like the PHP based user tool kit before it, this was the first Lua based user tool while version 2.51 was in development. It will reverse the notes in a selection, which can sometimes be inspiring when working with a composition. The new API available from within a Lua based user tool is currently documented online at: lua.noteworthycomposer.com. Much of the NWC Lua API is actually written in Lua. It can be explored from our gist on github. 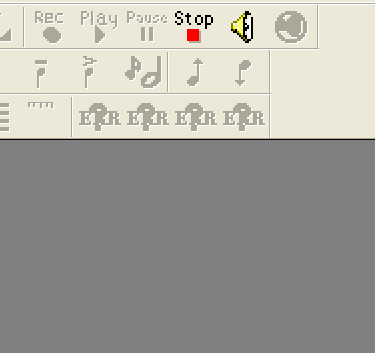 After upgrading NoteWorthy Composer to version 2.51, you may encounter several images that depict a question mark with the text ERR, as shown here. These icons depict old commands from version 2.50 that no longer exist. The old Insert toolbar contained a series of items that could quickly be added to the current staff simply by clicking the button from the Insert toolbar. These hard coded buttons have been replaced by user customizable selectors that can contain a single item, or a large collection of items. If your see something like this after upgrading, there are several alternatives to remove the now missing tools from your toolbar setup. If you want to maintain your custom changes to the toolbars, then you need to revisit your toolbar customizations and delete the commands that are no longer available. This is done by starting at View, Toolbars, then click the Customize button. The missing tools are probably on the Insert toolbar, which needs to be selected from the Toolbar dropdown box. The Active tools list will show all of the commands in the selected toolbar. You can select any commands that are labelled as ##Unknown## and press the button that shows as <–. This will remove the missing tool from that toolbar. You can also just double click them. If you have only made modest changes to the default toolbar setup in the prior 2.5 version, you might just want to reset your toolbars to the defaults. This is done by starting at View, Toolbars, then click the Customize button. The Restore Defaults button will reset your toolbars to the new version 2.51 defaults. NoteWorthy Composer Version 2.51 has been released. After nearly a full year of development, we started delivering this new release to customers about a week ago. We will be describing some of the new capabilities in version 2.51 in later posts. In the mean time, a summary of the additions in this release can be seen on NoteWorthy Composer’s history page. 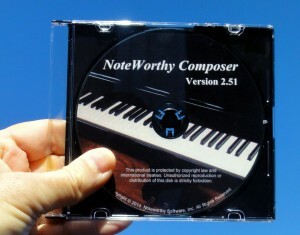 You can upgrade your currently installed copy of NoteWorthy Composer 2.5 by opening it, then from within NoteWorthy Composer 2.5, select the Access NoteworthySoftware.com command in the Help menu. You will automatically be directed to the page where you can download and install the NoteWorthy Composer 2.51 upgrade. Download and install the latest NWC User Tool Starter Kit. Download and install the NWC 2.51 Viewer. If you are new to NoteWorthy Composer, you can try out a demo of the program, as well as utilize our free Viewer to open files created by other users. We decided that it was about time to create a blog for the NoteWorthy Composer program and its development. You can expect all public developments pertaining to NoteWorthy Composer to start being announced here.